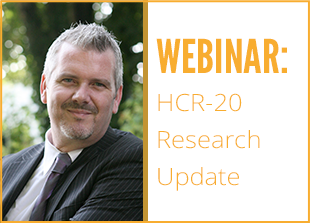 CONCEPT Professional Training, a global leader in online professional training in forensic mental health, announced today that it will host a 90 minute live webinar titled “HCR-20 Research Update”, on Wednesday, May 25th from 1:00pm – 2:30pm EST. This webinar will offer expert advice from Dr. Kevin Douglas. Dr. Douglas is involved in research that addresses threat assessment, violence risk assessment and management, the association between various mental and personality disorders (i.e. psychosis; psychopathy) and violence, and dynamic (changeable, treatment-relevant) risk factors. This Live webinar is intended for criminal justice, mental health, or victim support professionals interested in learning more about the HCR-20 Version 3 or those who are considering implementing the HCR-20-V3 into clinical practice. For more information on the HCR Research Update, visit here.